N.B. You can search this page to find a specific word or words such as William Coverdale by using the Find command in the top tool bar under "Edit." On 30 June, the Governor of New France, Count Frontenac (1622-98), establishes a French trading post (not extant) with the Iroquois at Cataraqui (now Kingston). Sieur de La Salle (1643-87) builds Fort Frontenac (not extant) at Cataraqui and establishes a seigneury. From here he explores west and south as far as the Gulf of Mexico on behalf of France. Lt Col Bradstreet (1711-74) leads a British force that captures Fort Frontenac and partly demolishes it. The American Revolution results in migration to Canada of United Empire Loyalists who are loyal to the British crown. Major John Ross, commanding officer of the 2nd Battalion, The King’s Royal Regiment of New York, with a large military force occupies Cataraqui and partly rebuilds Fort Frontenac in preparation for the arrival of the loyalists. The King's Mills consisting of both saw and grist mills are built at Kingston Mills. A number of saw and grist mills are built on the site during the 19th century. An early land survey in Ontario is begun in the Kingston area. Captain Michael Grass (c1732-1813) leads a party of Loyalists to Cataraqui, some of whom stay in the townsite while the majority settle in the first township, later named Kingston Township. The vast majority of the earliest buildings have not survived. Portrayed in drawings and paintings, they are of frame or log construction. The Rev. John Stuart (1740-1811), the first Anglican priest in Ontario, arrives at Cataraqui and establishes the first school the following year. He preaches in the first St George’s Church (see entry for 1792). Capt Jeptha Hawley (1740-1813), Loyalist, builds his frame house (still surviving) in Bath, Ernestown (now Loyalist) Township. Fort Frontenac is renamed Tête de Pont barracks and Cataraqui renamed King's Town, which becomes Kingston the following year. A naval dockyard and base for the Provincial Marine is established at Point Frederick. The Constitutional Act splits the Province of Quebec into Lower Canada (now Quebec) and Upper Canada (now Ontario). 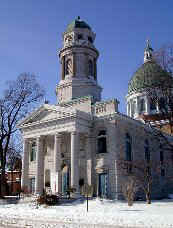 The first St George’s Church is built in frame construction (not extant) on King St E. between Clarence and Johnson Streets. See also entries for 1785, 1825, 1862 and 1899. Lieutenant Governor John Graves Simcoe (1752-1806) and his Executive Council are sworn-in at St George’s Church and hold their first formal meeting at Kingston. The first stone house (demolished 1929) in Kingston is built by the Smith family on Ontario Street at Queen Street. 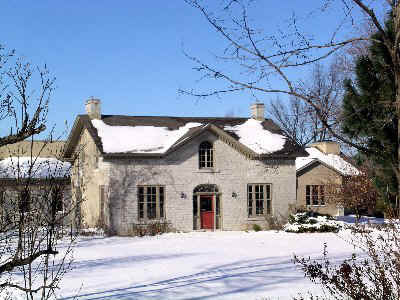 The frame Fairfield House (still standing) is built by a Loyalist family west of Amherstview. Much of the original interior woodwork has survived. The Kingston market is established and continues today on the land behind the City Hall. St Joseph’s Roman Catholic Church (demolished 1891), designed by architect F.X. Rochleau (dies 1812), is built of stone on the corner of Bagot and William Streets. 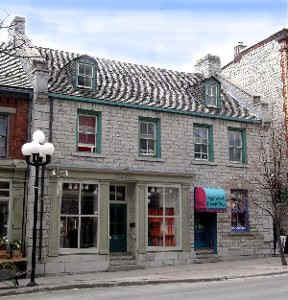 In 1808, Rochleau builds at 70-72 Princess Street - likely the earliest stone building still surviving in Kingston. The arrow points to the datestone: FXR 1808. The War of 1812 establishes Kingston as a major military centre. George Okill Stuart (1776-1862) is the minister at St George’s Church from 1812 to 1862 (the year it becomes a cathedral). Fort Henry is built on Point Henry in defence of the naval dockyard at Point Frederick. See the entry for 1832. After the war, direct British immigration increases the area’s population and gives rise to the need for more buildings. Richard Cartwright lays out a village on his land on the west part of lot 21, East of the Great Cataraqui River. In 1820, it is named Barriefield Village. 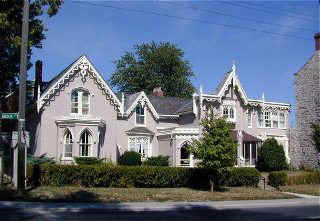 In 1980, it is designated as the Barriefield Heritage District. Gardiner House is built in brick – an unusual use of this material at this early a date. When first built, it is a farmhouse on a bay-shore of Lake Ontario; Portsmouth Village grows up around it. It still stands at 9 Kennedy St but the bay has been extensively filled-in. The Stone Frigate is built to store naval supplies at the Royal Naval Dockyard. St Andrew’s Presbyterian Church is built of stone by Archibald Fraser on Princess Street at Clergy, burns in 1888 and is replaced by the present building (architects Power & Son). There is an ever-increasing general trend to building in stone. The dominant style is Classical Revival. 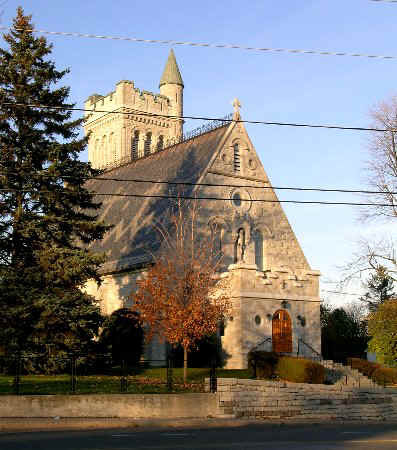 A stone parish house for St Joseph’s Church is built and acts as a home for Bishop Macdonell (1762-1840) when he is in Kingston; in 1846 it becomes the Notre Dame Convent, a primary school, and later a secondary school for girls. 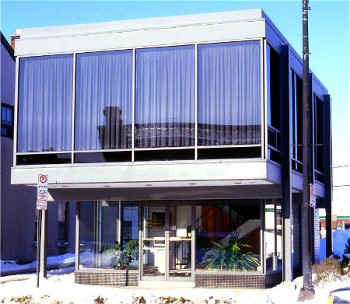 Today, it forms part of the Kingston Public Library on Johnson Street at Bagot Street. 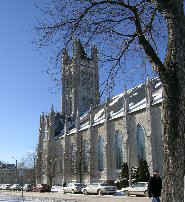 The cornerstone of the present St George's Anglican Cathedral is laid on King St E. at Johnson St. This is the first known architectural commission for Thomas Rogers (1778/82-1853). His design is altered c1840 when the front of the church is rebuilt and a new bell tower installed by architect William Coverdale (1801-65); this work is in turn altered by an enlargement of the structure in 1891 by Power & Son. See also entries for 1785 and 1792. Cataraqui Bridge is opened over the Great Cataraqui River and connects Kingston to Pittsburgh Township. The Gildersleeve House, one of an important group of stone neoclassical houses, is built about 1830 on the corner of King St East and Johnson St. Other houses include Charles Place (c1830) at 75 Lower Union St, and the Cartwright House (1833) at 191 King St E.
Robert Drummond (dies 1834) and James Morton (1808-64) run a brewery, known as “Morton’s Distillery” as late as 1900. 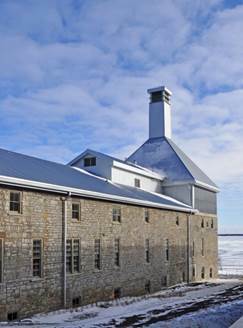 The stone brewery and distillery (owned by the City) is in use today for a variety of functions, and is known as the J.K. Tett Creativity Complex at 370 King St West. English-born architect Edward Horsey (1809-69) arrives in Kingston His commissions include the Frontenac County Court House of 1855, with which he is assisted by his son Henry Horsey (1830-1911). Edward Horsey is the Penitentiary Architect 1846-69. The Rideau Canal from Kingston to Bytown (now Ottawa) is completed. Experienced stone masons are engaged in building projects in the area. 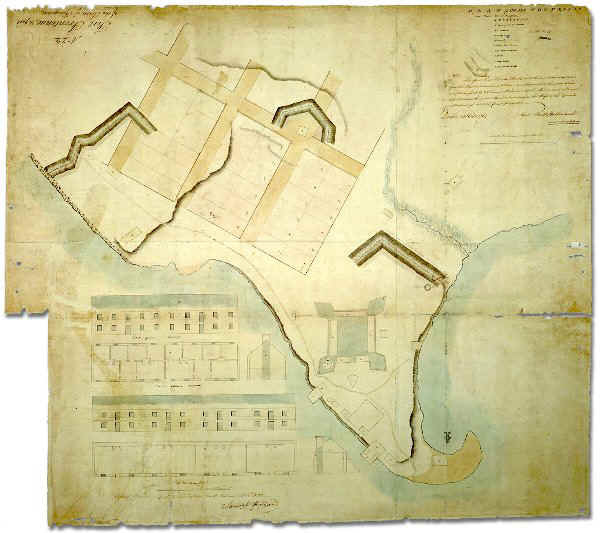 The construction in stone of a new Fort Henry, on the same site as the fort of 1813, begins following ten years of planning by two Ordnance Board commissions and four years of preparation by Royal Engineers. 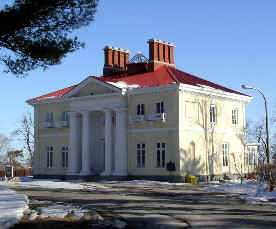 Alwington House (burnt 1958) is completed as the residence for Baron Longueuil on the eastern outskirts of Portsmouth Village; it is altered by architect George Browne to act as Government House, the vice-regal residence of the Governor General from 1841 to 1844. Kingston Penitentiary (“KP”) is established as the Provincial Penitentiary; it receives its first inmates in 1835 and thus becomes Canada’s oldest reform penitentiary. It is a steady source of employment for the inhabitants of Portsmouth Village, which grows around it. 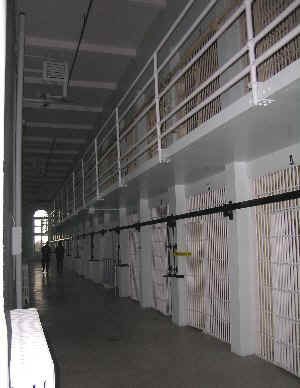 KP is still in use today as a federal maximum security institution. See entries for 1845 and 1846. English-born architect William Coverdale (1801-65) arrives in Kingston from south of Montreal to work at the Provincial Penitentiary from 1834 to 1846. He is City Architect from 1846 to 1865. The penitentiary closes in 2012. 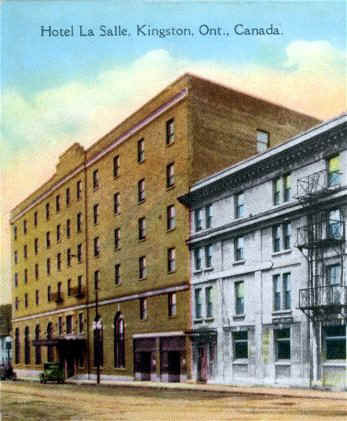 John A. Macdonald (1815-91) opens his law practice in Kingston at 171 Wellington Street, and is admitted to the Bar of Upper Canada the following year. During these years, he lives at 110-112 Rideau Street. Sir Richard Cartwright (1835-1912), the grandson of the Hon. Richard Cartwright (1759-1815, one of Kingston's first residents), is born in the Cartwright House (191 King St E.) of 1833; he becomes Minister of Trade and Commerce, 1873-78. 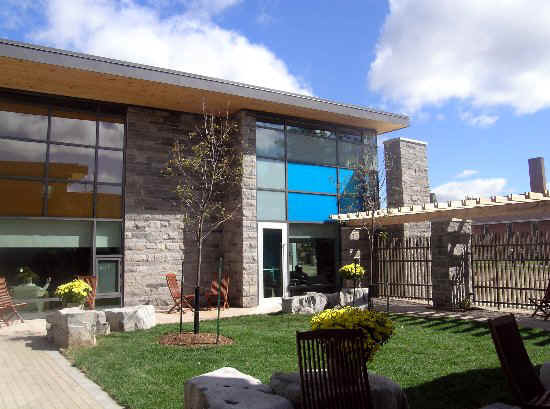 The stone Kingston General Hospital is completed but not opened due to a lack of funds. 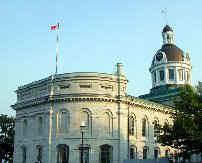 It is converted into a legislative building when Kingston becomes the capital of the united province of Canada East and Canada West, 1841-44. Extensively enlarged, it is still in use today. Construction begins on Summerhill, the impressive Palladian villa of Archdeacon George Okill Stuart (1776-1862), son of the Rev. John Stuart (1740-1811); it becomes the first permanent building of Queen's University in 1853. Queen Victoria (born 1819) comes to the throne and rules until her death in 1901. Rebellion breaks out first in Lower Canada and then in Upper Canada. Regiopolis College is founded and its building cornerstone laid by Bishop Alexander Macdonell (1762-1840) in 1839. 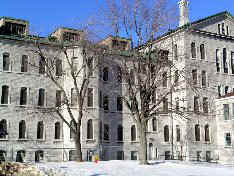 The college, a training school for priests and located at 123 Sydenham Street (see also entry for 1892), is closed in 1869. During the Rebellions the local militia is concentrated in Kingston to replace the British regular troops who are sent to Lower Canada. Lt Col Sir Richard Bonnycastle (1791-1847), Royal Engineers, is in charge of the completion of Fort Henry when the Rebellions break out; he organizes the local militia and prepares the defences of Kingston against a rebel attack. Kingston becomes a town with Thomas Kirkpatrick (1805-70) as first mayor. Act of Union creates the United Province of Canada uniting Upper and Lower Canada. The first Board of Trustees of Queen’s College (granted a Royal Charter in 1841 and now known as Queen’s University) meets in St Andrew’s Presbyterian Church. Kingston becomes the first capital of the new province, which unites Canada East (now Quebec) and Canada West (now Ontario), until early 1844. Governor General, Lord Sydenham (1799-1841), moves into Government House (Alwington House, see entry for 1832), but dies before the end of the year and is buried in a vault under St George’s Church. The first parliament meets in the vacant hospital (see entry for 1835); some of the members are housed in Summerhill (see entry for 1836). Queen’s College is established by Royal Charter. 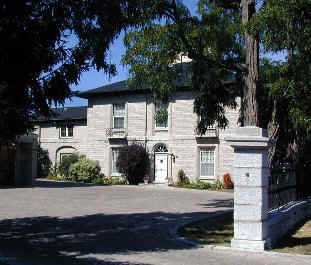 Roselawn, a country villa, is built (attributed to George Browne); it later becomes the home of Sir Henry Smith, Solicitor General of Upper Canada and Speaker of the House (1851-68), and in 1974 the Donald Gordon Centre, a conference centre for Queen's University. New structures are incorporated onto the courtyard in 1997; Griffiths Rankin Cook Architects. Sir Charles Bagot (1781-1843) is appointed Governor General and moves into Government House (Alwington House, see entries for 1832 and 1841), where he dies the following year. Queen’s College opens for classes at 67 Colborne Street. Hazeldell, a country villa, is built in Portsmouth Village. 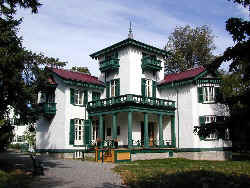 From 1860 to 1865 it was John A. Macdonald's legal residence and the home of his mother, who died there, and his sisters, Louisa and Margaret, and Margaret's husband, Professor James Williamson. For Bellevue House, please see 1848 entry. Architect George Browne (1811-85) designs City Hall, completed in 1844. By the time it is occupied, Kingston has lost its status as the capital of the United Canadas. The Shambles, an extensive market wing, burns in 1865, and is replaced by the present truncated version by William Coverdale. Sir Charles Metcalfe (1785-1846) arrives as Governor General. The cornerstone of St Mark’s Anglican Church, Barriefield, is laid (architect Alfred Brunel, 1818-87); the Gothic Revival church opens in 1844. The Commissariat Stores on Point Henry are completed, joining the Advanced Battery, built 1836, to Fort Henry. The cornerstone of St Mary’s Roman Catholic Cathedral is laid; the building is completed in 1848, and greatly enlarged in 1889 by architect Joseph Connolly (1840-1904). Photo of nave buttresses by J. McKendry© See entry for 1889 for more pictures. The government of the United Province of Canada leaves Kingston for Montreal; architect George Browne leaves as well and William Coverdale completes City Hall. Datestone of 1845 on the north stone gate and walls erected to protect the Provincial Penitentiary; architect, William Coverdale. Planned as early as 1840, the gate – modelled on a Roman triumphant arch – still dominates this part of King St West. Kingston is incorporated as a city; John Counter (1799-1862) is first mayor. The Oregon crisis spurs a military response in Kingston: four Martello towers (including the Murney Tower, see entry for 1925), the Market Battery in front of City Hall, and two ditch towers completing the defences of Fort Henry are built 1846-48. The penitentiary dining-hall has exposed cast-iron columns on the interior; architect Edward Horsey. English-born architect John Power (1816-82) immigrates to Kingston, and designs such buildings as St George’s Hall and the Registry Office. He is City Architect from 1866 to 1882. In 1873 he forms a partnership, Power & Son, with his son Joseph Power (1848-1925). A wave of immigrants, fleeing from the Irish famine, arrives in Kingston en route to other destinations. More than 1,400 die of typhus and are buried in a common grave near the Kingston General Hospital. 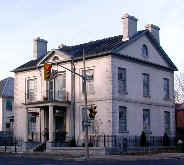 John A. and Isabella Macdonald move for short time into Bellevue House (now a National Historic Site at 35 Centre Street), an “Italian Villa,” attributed to George Browne, c 1842. Gibbs’s detailed map of Kingston is published. Cataraqui Cemetery, a non-denominational garden cemetery, is incorporated. One of the earliest surviving cemetery gate-lodges in the province is built by architect James Stewart (1821-1902). Brick begins to displace stone as a popular building material in Kingston. Limited use of iron as a structural material appears. Gothic Revival style makes an appearance. The Kingston County Grammar School (formerly the Midland District Grammar School) moves into new quarters (now Sydenham Public School); it becomes the Kingston High School in 1871. Hillcroft, a villa designed by William Coverdale, is built for Francis Hill (1809-54), mayor of Kingston, at 26 Hillcroft Drive; later it becomes the home of Sir Alexander Campbell, a political associate of Sir John A. Macdonald. 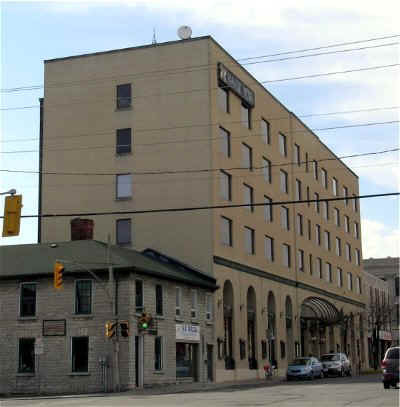 Irons Hotel (now the Hotel Frontenac) with four full storeys may be the tallest building in Kingston; architect John Power. 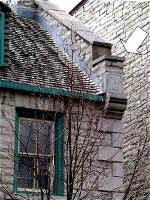 John Meagher (1816-78), head of the family that founded Meagher's Distillery Limited of Montreal, one of Canada’s largest producers of liqueurs, builds a stone residence at 85 Barrack Street. The Custom House and Post Office are designed and completed three years later by Hopkins, Lawford & Nelson. Kingston is connected to Toronto and Montreal by the Grand Trunk Railway. The Crystal Palace (demolished) is built on Palace Road south of Bath Road as the first permanent hall in Canada for the annual display of manufactured and agricultural goods. The architect is Henry Horsey (1830-1911). John A. Macdonald becomes Premier of the Province of Canada; that same year his wife, Isabella, dies. 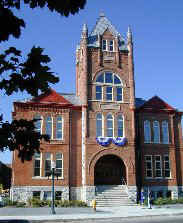 The Village of Portsmouth is incorporated; a town hall is built in 1865; architect William Coverdale. In 1952 the City of Kingston annexes Portsmouth. The Wolfe Island Township Hall is erected; architect Edward Horsey. Rockwood Lunatic Asylum is built 1859-70 (architect William Coverdale) on the western outskirts of Portsmouth Village. 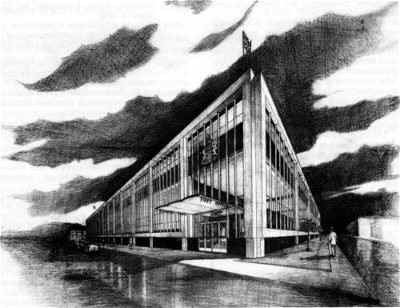 Built according to the Kirkbride “linear plan,” it is a state-of-the-art hospital. It is the forerunner of the Kingston Psychiatric Hospital, built in 1959 and taken over by PCCC Mental Health Services in 2001. The future of the old stone asylum, closed since 1997 as a residence for persons with mental disabilities, is uncertain. See also entry for 2002. The stone Orphans’ Home is opened by the Widows' Friend Society on the corner of University Avenue and Union Street, attributed to William Coverdale. 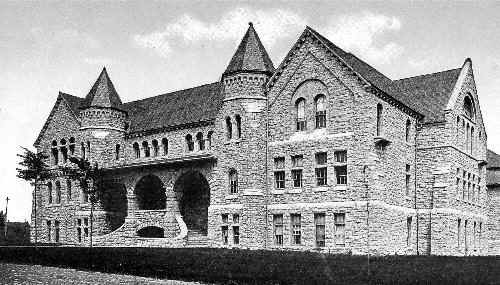 In 1927, it was acquired by Queen's to become part of the Students’ Memorial Union (burnt 1947). The Dominion of Canada is formed on 1 July; John A. Macdonald is appointed Prime Minister. The last British troops to be garrisoned in Kingston are withdrawn. The Kingston and Pembroke Railway is incorporated and construction begins in 1872. The Market Battery is demolished (see 1846 entry); and on the site a park is built in 1876. In 1885 with the building of the Kingston and Pembroke Railway station, it becomes Kingston's “Inner Station” until 1961. 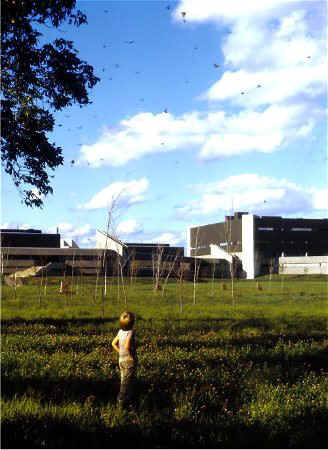 In 1967 the area is redesigned and renamed Confederation Park. The Kingston High School is renamed the Kingston Collegiate Institute. 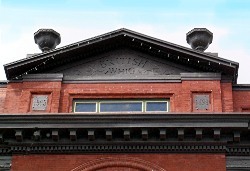 Macnee & Minnes dry goods store (rebuilt after a fire in 1990 for a drug store by architect Ernest A. Cromarty) at Bagot and Princess Streets may be the first use of the Corinthian Order as a major exterior element in Kingston; architect John Power. Alexander Mackenzie (1822-92), a member of the Liberal party, becomes Canada’s Prime Minister until 1878. 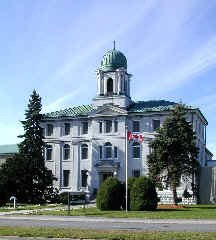 During this time Kingston benefits by the establishment of the Royal Military College; architect Robert Gage (1841-post1916). Mackenzie worked as a stone mason in Kingston in the 1840s. 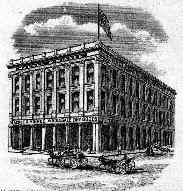 The architectural firm of Power & Son is formed (see also the entry for 1846). 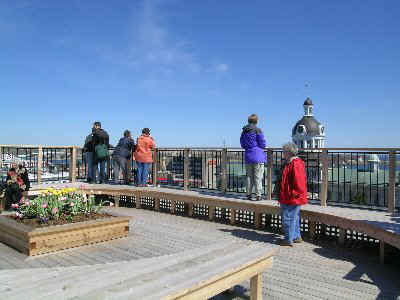 Brosius’s bird’s-eye-view of Kingston is published. William Newlands (1853-1926), a native of Kingston, begins his career as an architect. The Cotton Mill commences manufacturing cotton textiles on Cataraqui Street. In 1931, it is converted for processing wool, and closes in 1966. See entry for 1996. The new Theology Building, 1879 by Gordon & Helliwell, is only the second purpose-built school building at Queen’s University. Electricity is introduced in Kingston. St Andrew’s Presbyterian Church (architect, Joseph Power) will be one of the first new buildings to benefit from electricity. St Mary’s (Roman Catholic) Cathedral of 1843 is greatly enlarged by architect Joseph Connolly (1840-1904) in Gothic Revival style. Sir John A. Macdonald lays the cornerstone for the Kingston Dry Dock, a federal repair facility. 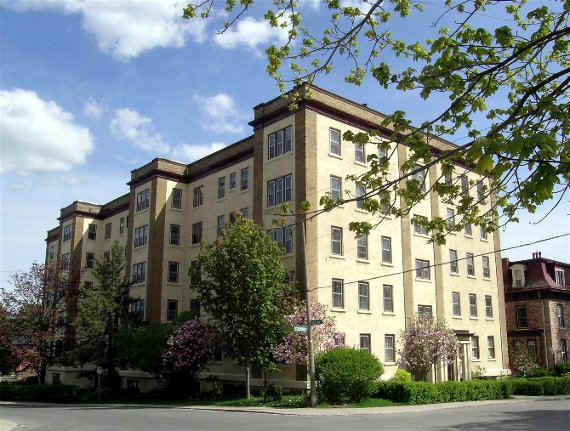 It is leased in 1910 by the Kingston Shipbuilding Company, which builds ships until 1968. 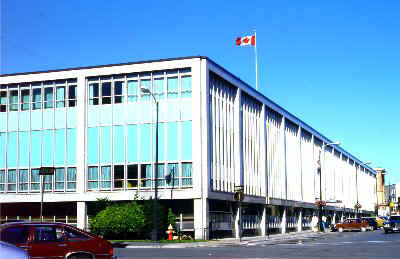 Today it is part of the Marine Museum of the Great Lakes complex on Ontario Street. The city builds a pumping station, designed in brick by Joseph Power in Romanesque Revival and – despite of a threat to demolish it in 1960 - open today as a tourist site. Sir John A. Macdonald is buried in Cataraqui Cemetery. The Kingston Historical Society commemorates this each 6 June at the grave site. The Religious Hospitallers of St Joseph, who came to Kingston in 1847 to care for the sick and orphaned immigrants, open the Hotel Dieu hospital in the original Regiopolis College building (see entry for 1837). Sir George Airey Kirkpatrick (1841-99), son of the first mayor of Kingston (see 1838), is appointed lieutenant governor of Ontario. In 1903 a fountain is dedicated to him in front of the Frontenac County Court House. After a devastating fire on 1 January, St George’s Anglican Cathedral is rebuilt by Power & Son, architects (Joseph Power, 1848-1925). Death of Queen Victoria who has reigned since 1837. Her son Edward (born 1841) reigns until his death in 1910. Queen’s College expands with the addition of two large stone buildings by architects Symons & Rae – Grant Hall and Ontario Hall (right). A stone nurses’ residence (architect William Newlands) with Ionic columns opens at the Kingston General Hospital, where nurses’ training had been conducted since 1886. Later the building is named the Ann Baillie Building and today is a health museum. The Story of Old Kingston by Agnes Maule Machar is published. 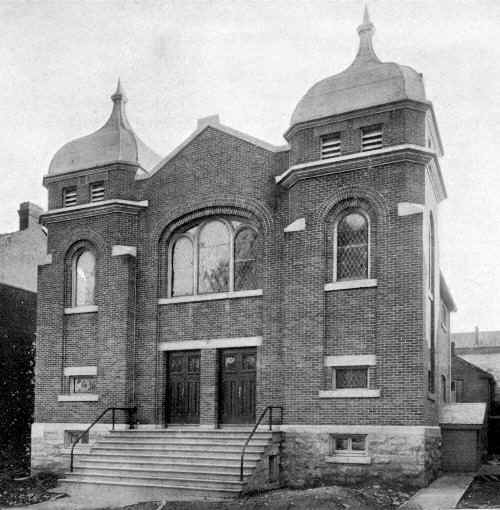 Beth Israel Synagogue is built at 148 Queen Street to the design of Power & Son, but is replaced by a new synagogue on Centre Street in 1961. Kingstonians strongly support the war effort at home and abroad during the First World War. 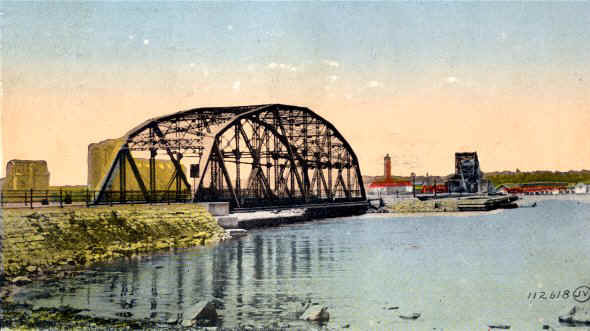 LaSalle Causeway is opened in connection with the planned construction of the Welland Ship Canal and to make Kingston the terminus of the Great Lakes. A time of economic prosperity. The Royal Military College of Canada Memorial Arch is erected in the form of a Roman triumphal arch by architect John M. Lyle (1872-1945). The Etherington family builds a new home on University Avenue in the Beaux Arts style. 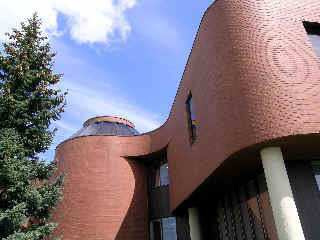 Today, it is the heart of the Agnes Etherington Art Centre. See also entry for 1957. The Kingston Historical Society opens the Murney Tower (built 1846) as a museum in early August. This function continues today. 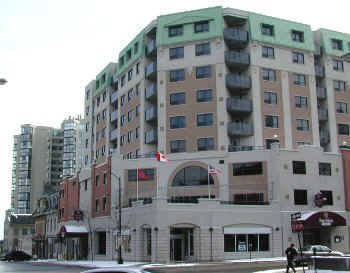 The second high-rise in Kingston on Bagot Street between Princess & Queen Streets -- built as the La Salle Hotel, it is now known as the LaSalle Mews. Unfortunately, the original brick facing, detailing and sash windows were "modernized" in the late 20th century. photo from Queen St by J. McKendry© detail of undated postcard, McKendry Coll. The Great Depression begins; life in Kingston is greatly affected during the 1930s, including a near riot at City Hall by the city’s unemployed in May 1933. Kingston opens an airport on 4 June. A grain elevator (demolished) is constructed at Little Cataraqui Bay (site of Elevator Bay park). 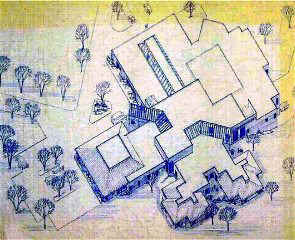 The blueprints date from 1929. The Kingston Historical Society rescues and moves the "Simcoe House" when it is slated for demolition. Located on Queen Street next to St Paul's Church, it is thought at the time to be part of the old Government House. Eventually, it is rebuilt at Upper Canada Village and is now interpreted as a farm building. 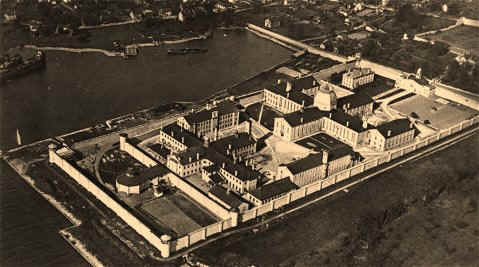 The restoration of Fort Henry begins under the direction of Ronald Way. 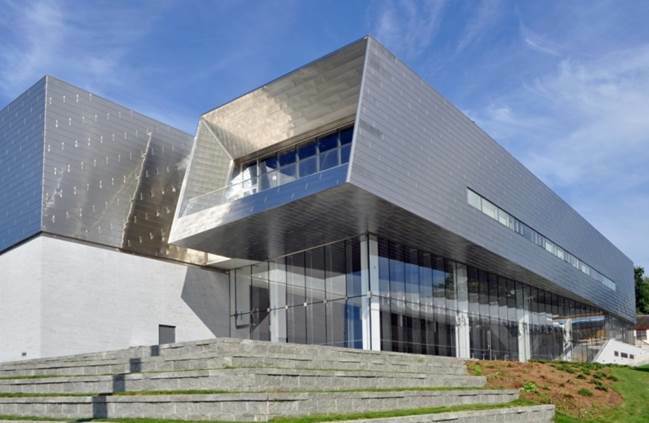 Two years later, it opens as a military museum and tourist site. The Thousand Islands Bridge to the USA is opened by President Franklin Roosevelt and Prime Minister William Lyon Mackenzie King. Canada declares war on Germany on September 10; Kingstonians support the war effort at home and abroad during the Second World War (1939-1945). The Alcan plant is under construction to produce rolled aluminium products. Plans for a 200-acre industrial development by Alcan-Canada Ltd, Kingston Works are unveiled in June 1972. 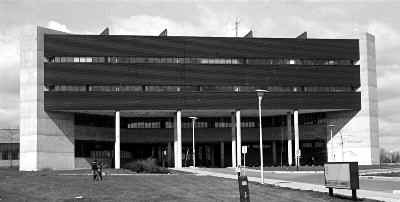 The plant is expanded in September 2000. On 1 January 2005, the name Alcan is changed to Novelis. Du Pont (then known as Canadian Industries Ltd) begins operations in Kingston to manufacture nylon. War-time housing is constructed to accommodate works in war-related industries. Post-war housing is also needed for returning soldiers. Discussions begin that will lead to the incorporation of the Grenville Park Co-operative Housing Association on 3 July 1946. Residences in a modern cubism style are soon under construction. A time of economic prosperity, the growth of industry and the development of subdivisions such as Polson Park in 1956. The move to the suburbs continues with Calvin Park in 1961. 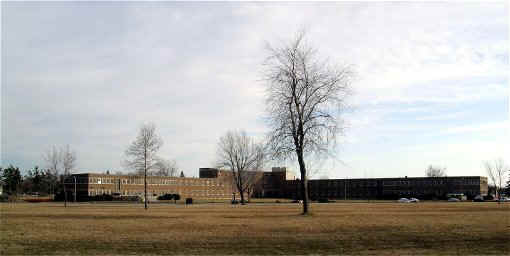 In this decade, a number of large military buildings, in a modern "stripped down" classical style, are built on the Canadian Forces Base Kingston, such as Lewis Hall, a barracks for 250 men in McNaughton Barracks, in 1953. Kingston's war monument takes the form of the Kingston Community Memorial Centre, erected in the fair grounds in 1950 to the design of Drever & Smith. Its fate is under debate today. Sentiments are expressed over the fate of the “Simcoe House,” a small frame house then thought to have been a meeting place for Governor Simcoe in 1792. It is dismantled, stored and eventually re-erected at Upper Canada Village. Kingston annexes over 5,500 acres in Kingston Township, including Portsmouth Village (see also entry for 1858). The coronation of Queen Elizabeth II takes place. The Celanese Canada plant for manufacturing polyester is built at Millhaven west of Kingston. Construction of Highway 401 in the Kingston vicinity is underway. Population 62,379 in the Kingston area. Polson Park subdivision. 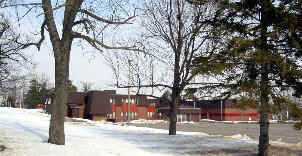 Polson Park Public School is built in 1959. Two new subdivisions, Balsam Grove and Kingscourt No. 4, are approved by the city planning department. See 1961 for Calvin Park subdivision. 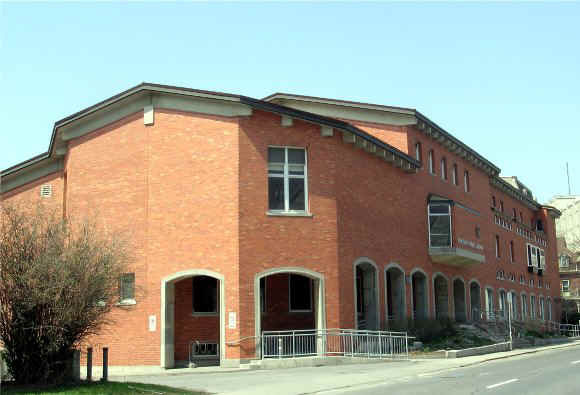 The Agnes Etherington Art Centre is founded with artist André Bieler as its first director. It is named after Agnes Richardson Etherington (1880-1954). See also entries for 1924 (picture) and 2000. The Kingston Shopping Centre is opened on 21 August, part of a trend (such as K-Mart in1969-70) to develop such self-contained malls away from the downtown, culminating in the Cataraqui Town Centre of 1982. In 2004-05, however, the enclosed mall aspect of the Kingston Shopping Centre is demolished in favour of a “big box” concept; new structures are built during this process. The last of the demolition is in August 2005. At the same time, the open land across Princess Street on the Alcan (now Novelis) site is being developed with commercial outlets. The portico of City Hall is removed; it is not restored until 1966. The St Lawrence Seaway is opened. Richard Preston’s Kingston before the War of 1812 is published by the Champlain Society. A new federal building ho using the post office is opened on 12 January on Clarence Street; architects Drever & Smith (Colin Drever, 1887-1975 and Harry P. Smith, 1905-83). Consideration is being given to developing 150 acres of penitentiary farm land for houses to accommodate 3,500 persons. 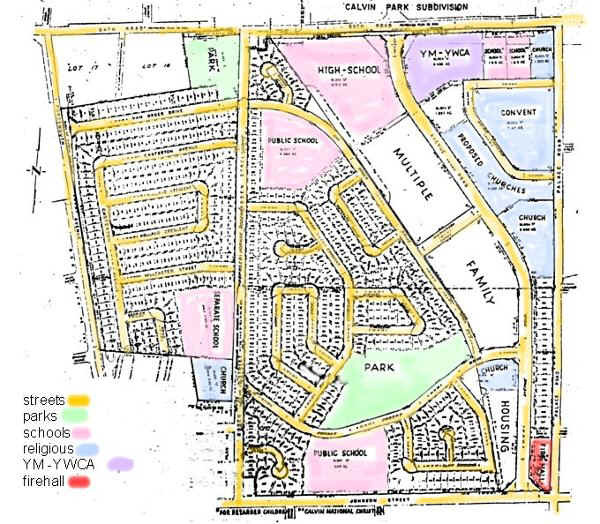 Proposed in 1960, site plans are drawn in 1961 and published in 1962 for Calvin Park subdivision between Johnson Street and Bath Road and west of Palace Road. This planned community is meant to address the housing shortage in the era after World War Two. Typical for the period is the use of curved streets and cul-de-sacs. The needs of families are met with proposed individual houses, multiple family units, parks, schools, a Y and numerous religious buildings. It is not until 1966 that a branch library is built. Services are being installed in the new Calvin Park subdivision. An official plan is presented to encourage high-rise development downtown. The Old Stones of Kingston. Its Buildings before 1867 by Margaret Angus is published. St Lawrence College opens (and is under expansion in 2002-3). Photo in 1973 from King St W. (left) with migrating monarch butterflies and from Portsmouth Ave. (right) by J. McKendry©. Bellevue House is opened to the public in May. See also the entry for 1848. The Frontenac Mall is under construction. 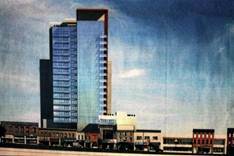 The Holiday Inn establishes a model for high-rise development on the waterfront. The annual CORK sailing regatta takes place in Portsmouth Harbour. Proposals for the redevelopment of Block D, an early industrial site where locomotives were manufactured, are presented by William Teron but the site remains undeveloped until the 21st century. See also entry for 2004. The first volume of Buildings of Architectural and Historic Significance appears as part of the City’s efforts to protect heritage buildings from demolition or unsympathetic alterations. By 2002 there are six volumes published, and more than 380 properties listed or designated. 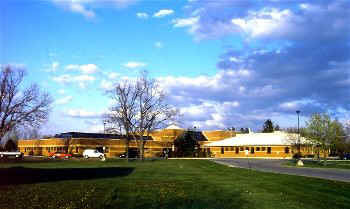 Northern Telecom locates in Kingston Township. Ground is broken for the Canada Cement Lafarge Ltd plant near Bath in September. Millhaven Penitentiary is opened as a super-maximum, ultra-security facility. Elrond College, one of the tallest buildings in Kingston at this time, is opened for student housing at 401 Princess Street, architect Irving Grossman. 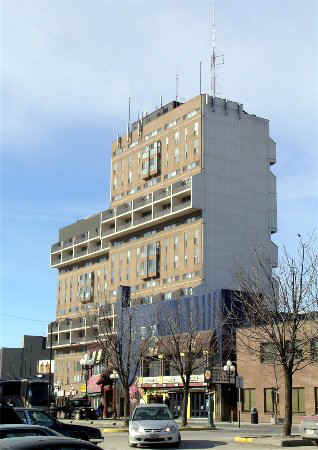 Now known as the Princess Tower, it is 16 storeys. The Frontenac Historic Foundation (now the Frontenac Heritage Foundation) is founded and dedicated to the preservation of heritage buildings. The city struggles with how to finance acquiring Le Moine’s Point Park. The city alters the shoreline of Breakwater Park to accommodate rock and soil excavated during the building of the new Health Science complex at the Kingston General Hospital. Kingston celebrates its tercentennial (see entry for 1673). Despite the enthusiasm for history, there are many important losses of heritage properties (such as the Counter House of 1833 on Block D and George Browne’s Mowat Building of 1841) by demolition in the 1970s. “Heritage Kingston,” an exhibition at the Agnes Etherington Art Centre is held June to October. The Cataraqui Golf and Country Club on King St West is designed by E.A. Cromarty. It replaces the first club house, designed by Colin Drever in 1917 and burnt in 1973. The Portsmouth Olympic Harbour Building is built for the International Sailing Olympics. Architects: Cromarty, Dominik, Inglis, MacLennan, Mill, Ross and Sorensen. Now used for city and commerical offices and rental facilities for special events. 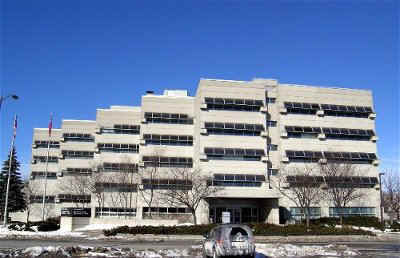 The Marine Museum of the Great Lakes is opened at 55 Ontario Street. See entry for 1890. To Preserve & Defend: Essays on Kingston in the Nineteenth Century (editor, Gerald Tulchinsky) is published. Planning is underway for the Cataraqui Town Centre, opened in 1982, as part of the projected population expansion in Kingston Township. 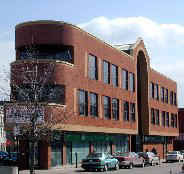 The Kingston Public Library moves into its present headquarters on Johnson Street in March; architects Sorensen & Inglis. County of a Thousand Lakes: the History of the County of Frontenac 1673-1973 (editor Brian Rollason) appears. Incorporation of the Cataraqui Archaeological Research Foundation to oversee the excavation of Fort Frontenac. 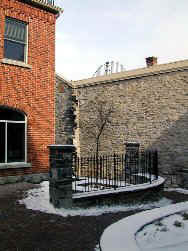 Their headquarters are at the Kingston Archaeological Centre, 611 Princess Street, 613-542-3483 and their website is www.carf.info (off-site link). In the city and adjoining townships there is a population of 108,502 (51% of this is in the city itself). Brian Osborne and Donald Swainson’s Kingston: Building on the Past is published (new edition in the works 2009). Ongwanada (left, aerial drawing 1986) is designed on Portsmouth Avenue by Domink, Thompson & Mallette. Three late Victorian brick houses are moved from University Avenue to the corner of Sir John A. Macdonald Blvd and Union St. 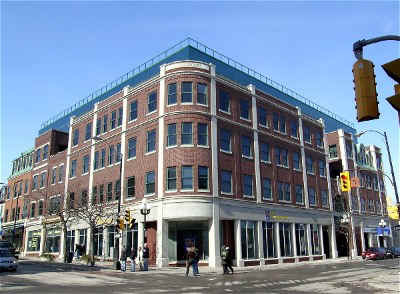 The Royal Block is built at a prominent location on Princess Street at King St East by architect Ernest A. Cromarty. 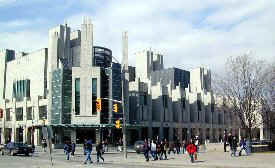 The Joseph S. Stauffer Library opens at Queen’s University; Kuwabara Payne McKenna Blumberg, Architects; in a modern Gothic style. 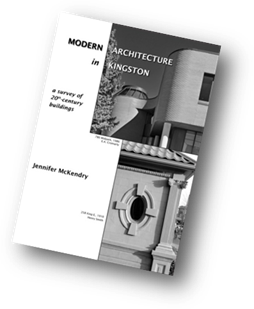 Jennifer McKendry’s With Our Past before Us: Nineteenth Century Architecture in the Kingston Area is published by the University of Toronto Press. Kingston celebrates its 150th anniversary as a city. See entry for 1846. 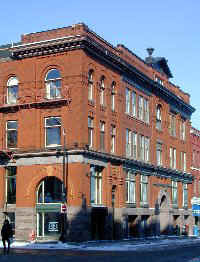 The Whig-Standard moves from its purpose-built building of 1894 (architect Joseph Power) on King Street East to the Woollen Mill on Cataraqui Street. See entry for 1879. On 1 January the City of Kingston (population 56,597 in 1991), Kingston Township (population 43,755), and Pittsburgh Township (population 12,890) are amalgamated into one municipality of over 110,000 persons. Mill & Ross design Staples, an unusual example of a “big box” store in the downtown. Kincore holds an Open House 9 April 2005 for the Rectory Building and British Building (both 1894-5, architect Joseph Power) on King St E. and Clarence St, as part of the company's efforts to renew and recycle existing building stock in the downtown area. The projects have been underway since 1999. The Brock Street Common, in use in 2001, is part of this effort. High-rise development continues downtown, as the Four Points Hotel Sheraton is completed (official opening April 2000); architects Dominik Thompson Mallette. Precedents include the Howard Johnson Hotel of 1977-9. The Agnes Etherington Art Centre opens its expanded quarters in May; Shoalts & Zaback with A.J. Diamond & Donald Schmitt, Architects in Joint Venture. See also entry for 1957. The federal Prison for Women (see entry and photo for 1930) is closed. The stone building will be retained as part of the land's acquisition by Queen's University in late 2007 (still mothballed in 2015). Construction is underway on the last of a trio of high-rises on King St W., west of Lake Ontario Park, along the waterfront. One is 12 storeys (opened in 2000) and the others 16 storeys. 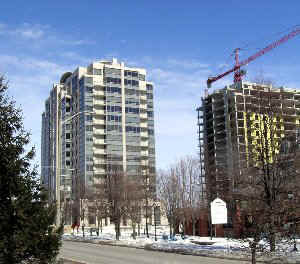 In 2009 more high-rises are being planned including accommodation for seniors. Planning continues for the redevelopment of hospital services in the Kingston region, in particular the creation of a new ambulatory hospital on the site once owned by the Cartwright family (see the entry for 1842) and then by the Kingston Psychiatric Hospital (see entry for 1859). Construction of a new building, combining mental health services and the relocation of the health care provided by St Mary's of the Lake Hospital, is underway in 2014 (and expected to be finished in 2017) on King St W. at Portsmouth Ave. Parkin Architects Ltd.
A new building for the Kingston Frontenac and Lennox and Addington health unit is under construction on Portsmouth Avenue; architects Shoalts & Zaback. It replaces the old health unit of 1974 by Mill & Ross. St Lawrence College Superbuild Project; Shoalts & Zaback with Diamond and Schmitt, architects in joint venture. See entry for 1967. 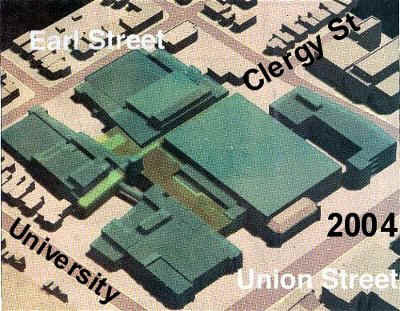 Proposed Queen’s Centre on University Ave., Clergy St, Earl St and Division St. The late 19th and early 20th centuries brick houses on University Ave. will be preserved and a part of Clergy St will become a pedestrian area within the site. Design architects are Bregman + Hamann Architects of Toronto and Shoalts & Zaback of Kingston. The site, cleared in 2006, is under preparation in 2007 and construction is nearing completion in late 2009. Demolition is completed on the enclosed mall version of the Kingston Shopping Centre, which now features "big box" stores in use 2006. The Alcan (now Novelis) site is being developed for commercial outlets. Kincore with architects Behnisch, Behnisch & Partner (of Germany) and Shoalts & Zaback is proposing innovative structures on the empty land along Clarence St and behind the buildings that face King St E. This development may involve demolishing a number of buildings along Brock Street. No construction has occurred as of late 2009. Plans for developments on “Block D” on Ontario Street begin. (See entry for 1970.) 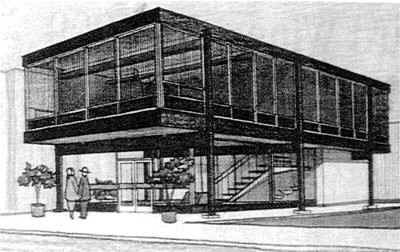 Proposal by architect Sandy Wilson for developers Gillen Engineering and Homestead Land Holdings for apartments (left), a hotel and an office building (right). Groundwork is underway in 2005 with the buildings under construction in 2006-07. 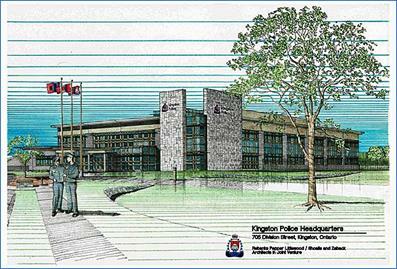 New police headquarters for the City of Kingston at 705 Division Street, planned in 2005, opens in October 2007. 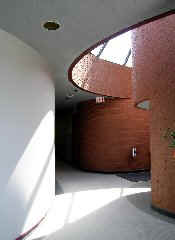 Architects Rebanka Pepper Littlewood / Shoalts and Zaback, Architects in Joint Venture. 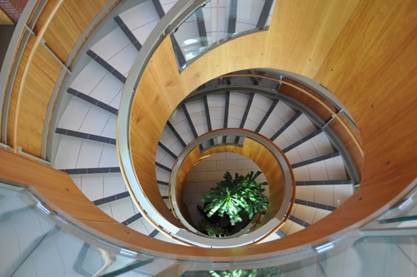 Incorporating conventional security considerations with “green” building design, it successfully expresses a commitment to environmental stewardship by meeting the requirements of LEED Gold. The design team followed four guiding principles: Reduce, Reuse, Recycle, and Rethink. 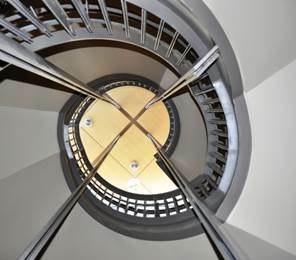 The metal spiral staircase forms an interesting abstract pattern, as one looks up. Planning is underway (finished in 2013) for rejuvenating Lake Ontario Park. The land was acquired by the government during the War of 1812 for strategic reasons. In 1894, the street railway company establishes a park on the southern part of point. It is not until 1930 that the city acquires all of the land south of King Street West and the park becomes the size we now know. 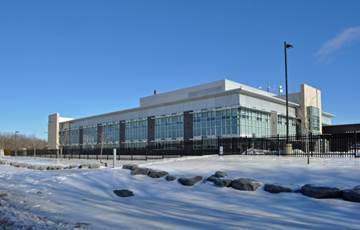 The Kingston Regional Sports & Entertainment Centre (previously, the Large Venue Entertainment Centre or LVEC), opposite Fort Frontenac on Ontario Street is under construction by Brisbin Brock Beynon Architects and opens in early 2008 as the K-Rock Centre. Queen's University hires the architectural firm of Snohetta (based in Norway, principal architect Craig Dykers) and EMA Architects of Ottawa to design a new home for drama, music and film studies at the Tett Centre on King St West. The new performing arts complex is built by 2014 (above) on this spectacular waterfront site, once the heart of a thriving distillery. Immediately to the east is the city-owned stone J.K. Tett Building (renovated by 2014, Colbourne & Kembel, Architects, Inc.). 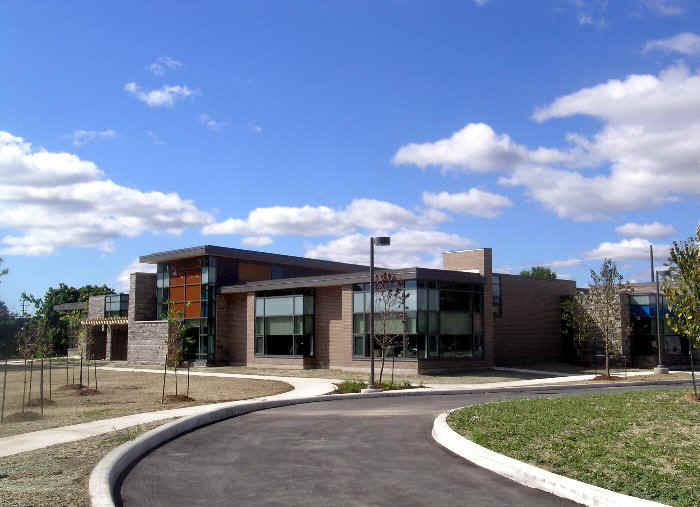 Shoalts & Zaback are the architects for a new Calvin Park Public Library branch on Wright Crescent to replace an existing one dating from 1966 by Drever & Smith. Consideration is being given to designating Old Sydenham Ward (which finally happens in the spring of 2015) as a designated heritage area; consultant Bray Heritage. Two such areas already exist -- Barriefield Village (plan being updated in 2015) and the Market Square Area. Kingston Penitentiary closes. No plans have yet materialized for the future use of the waterfront property and its historic buildings (see 1833). See 2000 for Goodes Hall, Queen’s University. See 2007 for the re-opening of Lake Ontario Park. 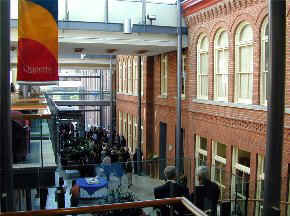 See 2007 for the Tett and Bader centres. The Capitol, an 18-storey condominium development, is proposed by IN8 Developments Inc. on Princess Street at the site of the Empire-Capitol theatre, which will have its 1920 façade preserved. The high-rise will run through to Queen Street and tower over the neighbouring buildings located in an important historic area. See 2002 for Providence Care Centre (under construction in 2015).